The band Purple Heys playing to the lovely and local Sherry Nevins. 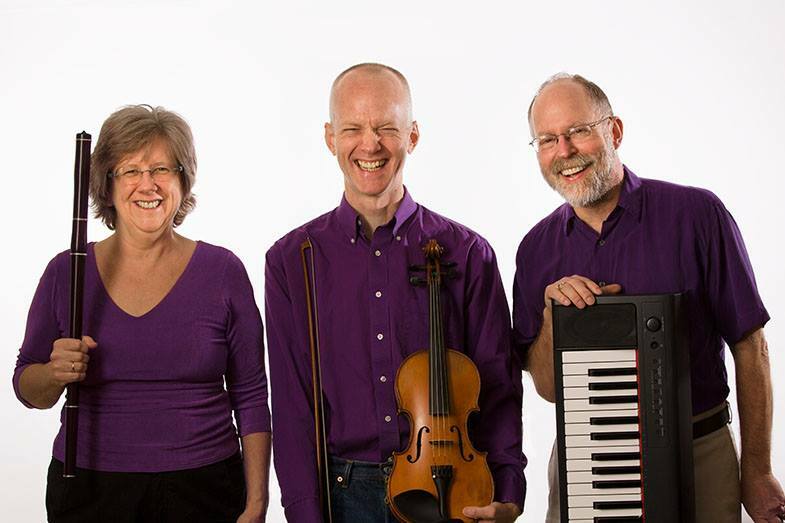 Sean Bolton (fiddle); Melissa Coffey (whistle, flute, fiddle, sax); Doug Plummer (piano)From fast moving New England and relentlessly cheerful French Canadian tunes, to rollicking old-time standards, Purple Heys rocks the dance floor. Crisp fiddle licks, sparkling whistle riffs, inventive chord accompaniment, and the smile-inducing honks of the saxophone inspire big fun on the dance floor. 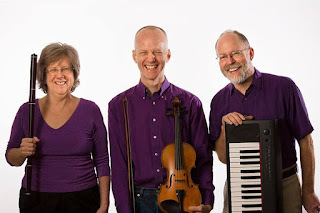 Sherry has had great fun calling traditional square dances since 1977 and contra dances since 1980, also occasionally teaching a couple dance workshops. She began coordinating community dances in Seattle in 1979. She especially enjoys calling family dances where adults and children of all ages participate together. Her informal style and boundless enthusiasm paired with her clear teaching and a married, lively repertoire ensure a satisfying dancing experience for all.